If you’re leaving animals off your plate, you’re already living quite the compassionate life — by going vegan, you spare about 95 lives each year, and thousands more over a lifetime! But what if there’s more you can do to live a kind life? Read on for three ways to up your compassionate shopping game. Minimize your impact — Since organic cotton is not grown with toxic chemicals, it doesn’t damage the soil, has less of an impact on air quality and uses 71% less water and 62% less energy than conventionally grown cotton. That’s a big deal when you consider that conventional cotton uses about 16% of the world’s insecticides and 7% of pesticides! Proactively address projected water shortages — In less than ten years, two-thirds of the world’s population may face water shortages. That’s distressing to think about, but organic cotton can help! Since it’s 80% rain-fed, it lessens the pressure on local water sources. Do your part for farmers and their families — If you’re like me, you’ve had your fair share of people saying, “But what about people who are suffering?” when confronted with being a voice for animals. Here’s the good thing about compassionate living: It benefits every living being, and organic cotton is no exception! By choosing organic, you’re helping farmers and their families avoid being exposed to toxic chemicals. You’re also helping keep conventional cotton out of our diets since cotton seed oil is used in a variety of food products. For those times when you can’t shop local, another good option is to focus on shopping small. One reason I like to shop small is it’s easier to figure out if the vendors I’m supporting are aligned with my values. For instance, when I buy gifts from Lyndsay at The Vegan Potter, I know that she’s committed to producing ethically made pottery and supporting her community through programs such as Clay for a Cause. Same goes for buying tees from Andy at Compassion Co. — I know that he’s just as committed to organic cotton (and eco-friendly production) as I am, so I can shop worry-free. 3. MAKE A STATEMENT: Speaking of Compassion Co., my husband, Jake (you might know him as Mr. Pony if you follow me on Instagram), recently wore his favorite Compassion Co. t-shirt to the bank for a quick errand. The woman who helped him with his transaction noticed the vegan message and opened up to him about her struggles with going vegan, especially when it came to swapping some of her go-to foods for more compassionate options. Jake took the conversation as an opportunity to recommend some personal favorites. He also empathized by letting her know that she wasn’t alone in the struggle, and that it gets easier. 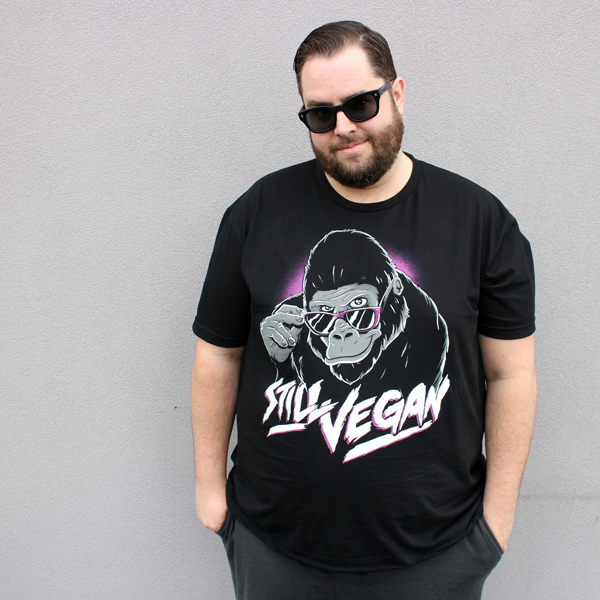 Take a note from Jake and add some vegan gear to your wardrobe! Bonus points if it’s made from organic cotton and you buy it from a local vegan company. When your new vegan gear gives you opportunities to talk about your compassionate lifestyle, make the most of those chances by being just that: compassionate! You’re making a huge difference by shopping vegan! Now try sticking to organic goods (both food and apparel), patronizing local businesses, and wearing your vegan heart on your sleeve to make an even greater impact. 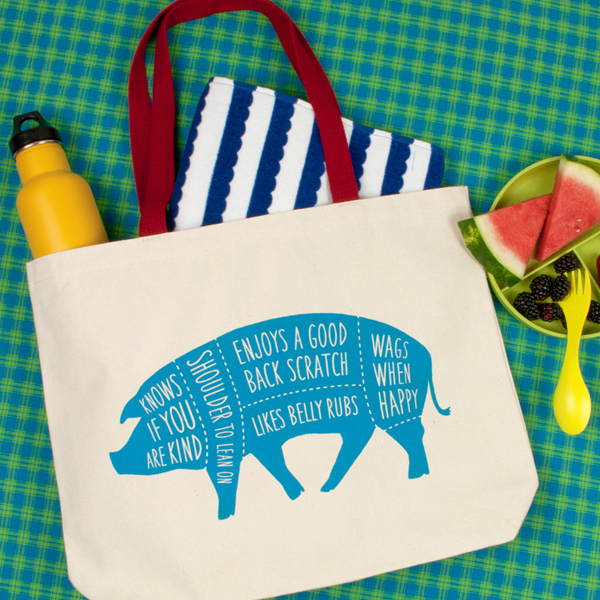 Laurie Johnston is the owner of Two Trick Pony, a Massachusetts-based, eco-friendly greetings and goods company. When she’s not screenprinting, Laurie spends time volunteering for Maple Farm Sanctuary and trying to pet as many dogs as she possibly can in one lifetime. Helpguide.org, "Organic Foods: What You Need to Know." GoGreen, "The Environmental Benefits of Buying Locally."